The following letter to the editor was published in the October 2008 issue of the American Journal of Nursing in response to Diana Mason's editorial regarding the recent loss of the American Red Cross Chief Nurse Officer due to budget cuts. Additionally, Mason expressed concern that there was no nurse representative appointed to servve on the HHS National Advisory Council for Healthy People 2020. "I, too, am concerned by the lack of nursing leadership that results in the disregard for nursing and lack of prestige and prominence of nurses in health care arenas (Editorial and AJN Reports, July). The National Nursing Network Organization, of which I’m a board member, is taking action by leading a campaign to establish the Office of the National Nurse. This nurse leader would serve as a visible national spokesperson for professional nursing, working with nurses in the community to focus on prevention as a way of improving health outcomes. The timing has never been better, as the presidential candidates plan for health care reform. Few disagree that a national nurse would provide many benefits. One of these just might be assuring there is nurse representation on future advisory committees. Please visit http://nationalnurse.org for more information." Thank you to President-elect Suzanne Langroth, Executive Director Julianne Lawless and the American Association of Legal Nurse Consultants Board of Directors for their unanimous endorsement for the Office of the National Nurse initiative. For a complete list of supporters visit http://nationalnurse.org/endorsements.shtml. Below is the letter the AALNC sent to Congresswoman Lois Capps (CA-23) who co-chairs the House Nursing Caucus. Consistent with AALNC’s mission of promoting the professional advancement of registered nurses consulting within the legal arena by providing a forum for education and exchange of information, The Board of Directors of the American Association of Legal Nurse Consultants has unanimously voted to endorse the Office of the National Nurse initiative. Founded in 1989, the American Association of Legal Nurse Consultants (AALNC) is a not for profit membership organization representing 3600 nurses nation-wide. AALNC is dedicated to the professional enhancement and growth of registered nurses practicing in the specialty of legal nurse consulting and to advancing this nursing specialty. In this capacity, we support endeavors which help bring about higher awareness to the vital role of registered nurses in the healthcare and legal process. As legal nurse consultants, we are involved with the potential risks and challenges of our healthcare system and promote patient safety as well as education nation wide. We believe that by establishing this office, more attention will be brought to bear on these challenges as well as more education to the American public on how to proactively address their health. We are pleased to join the multiple professional organizations supporting your reintroduction of this vital legislation. The American Association of Legal Nurse Consultants believes the establishment of a more prominent and visible presence of nursing will promote the profession and consequently, the public health. We are working with the folks at CityTownInfo.com, who have created a free widget http://syndication.citytowninfo.com/widget/getwidget-nursing.shtml just for nursing blogs like yours. We believe that adding this widget to your blog will give your visitors useful information about nursing schools. This includes nursing school locations, types of degree programs, and different concentrations in the nursing field. College profile data is delivered through the widget without requiring your visitor to leave your site. In other words, we're offering you unique, relevant content that is valuable to your readers -- for free. Why? Because we want to let more people know about the useful content on CityTownInfo.com. We believe that our nursing school widget will be beneficial for your blog's visitors. The widget is a compact extraction of the wealth of nursing career and college info at http://www.citytowninfo.com/employment-categories/nursing. And if you need any technical assistance with the widget, or want any advice on how to customize it for your blog, don't hesitate to ask us. Today the Portland Community College Chapter of the National Student Nurses Association hosted the second annual "Haunted Hospital". Student nurses are studying health promotion and leadership principles in their coursework and recognize that Halloween safety is a must. 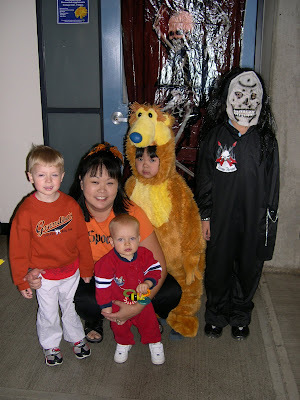 The student nurses had three goals: first, for children to learn a bit more about their own bodies and how they work; second, to help the kids understand how they can take better care of themselves and prevent accidents; and finally, to provide parents with some tips for Halloween safety. The event was hosted in the Nursing Lab. Each bed and unit had a theme such as hygiene, bone health, bicycle helmut safety, and nutrition with a trick or treat focus. Every adult who accompanied their child through the Haunted Hospital received a handout. The students felt it was important that the information be written in easy to understand language, using these evidence-based practices to simplify their educational tool. Use short words with only one or two syllables. Spell words out rather than using abbreviations or acronyms. Bastable, S.B. (2003). Nurse as educator: Principles of teaching and learning for nursing practice. (2nd ed.). Sudbury, MA: Jones and Barlett Publishers. Prevention and health promotion, that is what the Office of the National Nurse campaign is all about. We hope everyone has a safe and happy Halloween! Thank you to the parish nurses in Kansas who recently signed on their support to establish an Office of the National Nurse. On behalf of the parish nurses in Kansas I am writing in full support of the initiative to establish an Office of the National Nurse. We believe that it is necessary for nurses to provide quality, safe, and compassionate care to all Americans and this must include prevention. Parish Nursing is all about prevention and health promotion in faith communities. If we can prevent disease and illness our congregants will live healthier, longer lives. The financial impact on the healthcare system will be lessened; the uninsured crisis could become less of a burden if people had preventive health care. We desperately need someone in a national position advocating for preventative health care for all. We thank you for advocating for nursing and supporting our important work. We look forward to reintroduction of legislation that will create the Office of the National Nurse. Please know that we are here to serve in any way that we are needed. Executive Director Kansas Parish Nurse Ministry, Inc. Thank you to Shelby Evans, Associate Editor of ADVANCE for Nurses who authored a recent article about the Office of the National Nurse initiative in the September issue, "United State of Nursing". Ms. Evans summarizes the entire article in her sub-heading, Quest continues to establish an Office of the National Nurse. The author takes us back to May 2005 when the op/ed, "America's Nurse" was published in The New York Times. It contains the current proposal that was revised in the summer of 2007 based on feedback the National Nursing Network Board of Directors received from national nursing leaders, stakeholders, and elected officials. The importance of the prestige implicit in the concept of a National Nurse is part of the reason the campaign seeks to grow the office from the current USPHS chief nursing officer role. The position already is aligned to work directly with the office of the Surgeon General and is reputable among public health nursing leadership. "We want to elevate that stature and bring about cooperation, not competition, and work together on common goals," Mills said. "We do need to do something differently, and it is a paradigm shift in some regards — and yet not really. All the pieces have been in play for years, we just have to put them together." The fragmentation of the nursing profession in recent years, due to emphasis on specialty, education level and other factors, is something that could be improved through national nurse leadership, Mills believes, and uniting in common goals is crucial. "There's just too much work to be done to be pulled apart; we need to come together."